Setting up your conference for submissions is a 7 step process that enables the system to accept submissions in the format required. 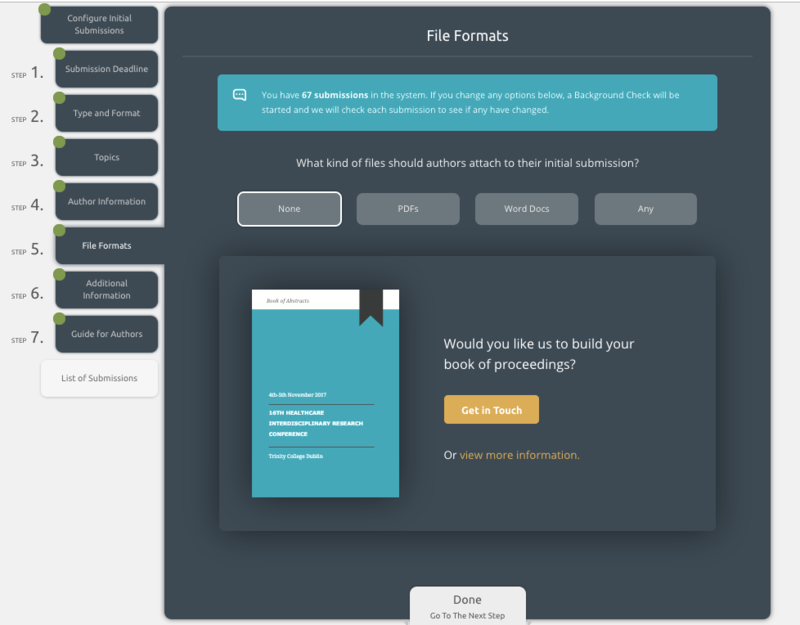 You can customize what the authors are asked for in each stage below. If you have any submissions in the system and change details in your configuration, a Background Check will be started. More information about this can be found here. Here you can set the deadline for submissions, which is the last day the system will allow authors to submit or edit their work. The deadlines comes into play on 23.59 on the date selected, in your timezone. You can change this deadline at any time. If you would like to extend your deadline for submissions you can check the guide located here. Choose the formats in which you would like to accept papers (for more information click here). There are three options as below. Abstract: This option only asks the author to enter in the abstract in the abstract box. Papers: This option lets an author enter in the abstract as above and then upload a paper as a file attachment. Extended Abstracts: This option only asks the author to insert the title and upload their extended abstract as a file attachment. It is important to note that if you select 'Papers': all authors must upload a file attachment for their submission to be complete. If you select 'Extended Abstracts': all authors must upload a file attachment and will not be able to directly edit their abstracts. 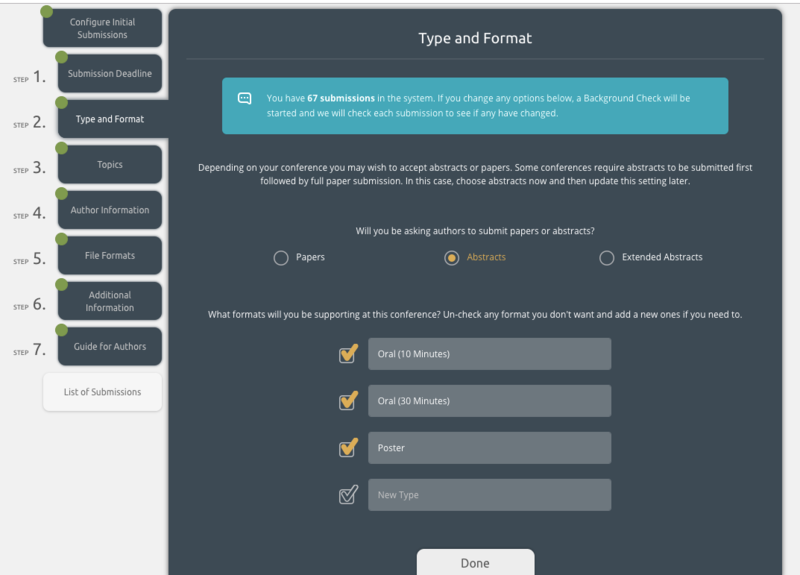 By default, Ex Ordo allows you to accept papers as either oral presentations or poster presentations. Here, you will have the option to edit this, and to include other options (e.g. accept papers as 'Oral (10 Minutes)'. Topics are the areas of research the submission relates to. Authors can choose which one of these topics are most relevant to their paper. In the reviewing stage, each reviewer can also choose the most relevant topic(s) for them to review. In our example below, we have 2 topic groups (Fruit and Vegetables) and 8 topics (Apple, Orange, Grape, Strawberry, Potato, Carrots, Onion, Parsnip). The topic group and topics can be inserted/edited by typing into the text box and selecting the + icon to add more. 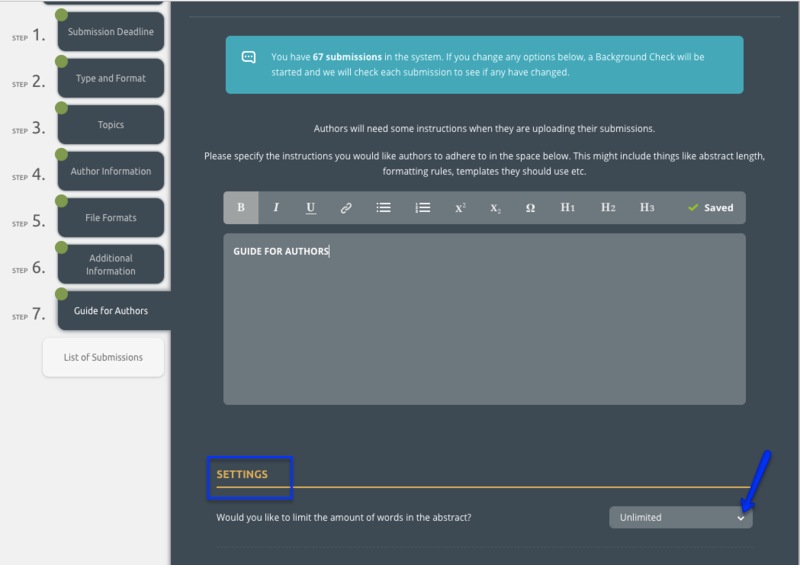 There is also an option to limit the number of topics that an author can select when making their submission or limit authors to choose topics from only one topic group. We also recommend that you do not create a topic labelled 'Other'. When in doubt, very often many authors will choose a topic entitled 'Other'. However, reviewers will generally not want to review submissions labelled 'Other': this creates a serious problem when allocating reviewers as there will be no reviewers for this topic (for more information click here). If topics don't apply to your conference, see here for more information. 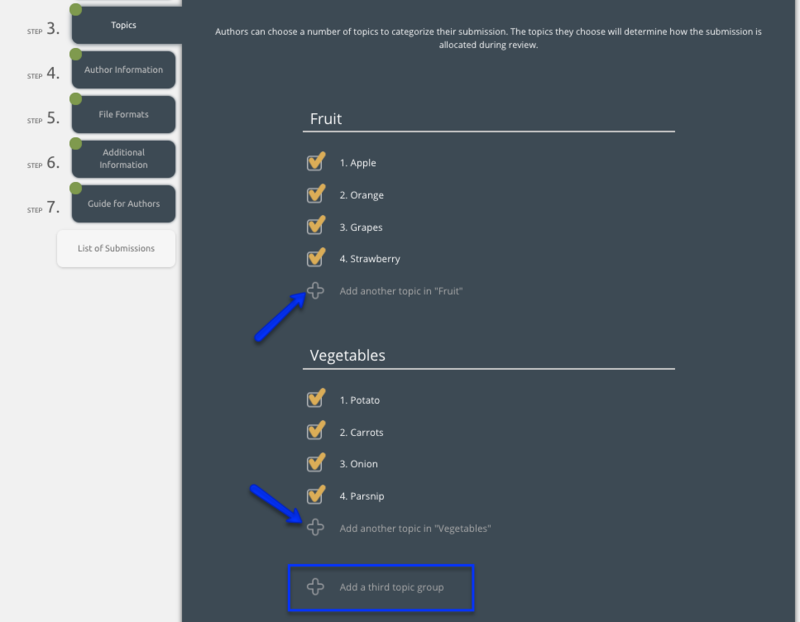 At the bottom of the Topic step, you can set up a limit on the number of topics authors can select when submitting or limit authors to select from only one topic group (Authors will have to pick topics from only Fruit or from only Vegetable topic group). The 'Authors' Step allows you to customize the author information you collect. You can decide what kind of information should be asked of your authors in the Author Settings panel. These options are listed below. You can decide the maximum number of authors that can be added to each submission. You can choose the maximum number of presenting authors that can be added to each submission. You can ask for each presenting authors' biographies be added to each submission and decide what word count these entries should have. If you need to know if students are submitting, you can ask your authors to confirm. In the Custom Question panel, you also have the option to add additional questions you need your authors to answer about themselves e.g their telephone number or credentials. These questions will be asked of every author on every submission. You can make each question optional or mandatory, depending on your requirements. More information about adding these fields can be found here. The 'File Formats' step gives options for the type of file formats you will accept. None: No attachment. Authors will type into the Ex Ordo abstract text box. PDF/Word: The system will control the type of file that is uploaded so that only PDF or Word can be submitted. Any: Allow authors to upload any file type. Note that this may cause problems where a reviewer or chair needs to download the file and does not have the associated program e.g. Adobe for PDF files. If files are enabled (e.g. 'Papers' or 'Extended Abstracts' then all authors must upload a file attachment for their submission to be accepted. If you are uploading files, we would recommend using the PDF file format as it gives you flexibility and consistency if producing a Book of Abstracts. If you choose anything other than 'None' you can also use the box on this page to provide instructions to the authors on the accepted formats. This is an optional step where you can request extra information about the submission e.g. ethics questions or references. If you a number of questions under different themes, you can split these into different tabs of questions. More information about adding these fields can be found here. The Guide For Authors text will be shown to authors when they begin their submissions. You can give them detailed instruction regarding the submission process, and it is recommended that you use this opportunity to provide clarification regarding research ethics, submission lengths, style, the reviewing process, etc. Here is an example of the text that you might use. Applicants may submit more than one abstract for review however the maximum number of presentations that will be offered to any one presenter will be one oral presentation and one poster presentation. - Title of abstract: maximum 150 characters. - Abstract word limit: 300 words. - The abstract should not include references. - Use the headings relevant to the type of abstract you are submitting (see Content of Abstract). - To facilitate the blind review process, individuals and institutions should not be identified in the body of the abstract; e.g. use ‘author's institution' instead of using the name of the company, university or hospital. You can use our text editor for better formatting and more accurate information display e.g. mathematical characters. More about text editor you can find here. You can also set the word limit for the abstract box here. Ex Ordo counts the words in the abstract box as the authors make their submissions. We recommend that you give some leeway on the word count; it is generally best to publicize one word count (e.g. 300 words) but have a larger word count in the system (e.g. 350 words). That's it! You have now completed the 'Configure Author Submissions' workflow and can begin collecting submissions. What is the difference between papers, abstracts and extended abstracts? Can I have 'Other' as a topic?